Lokma is a Turkish fried sweet dough that is covered in a simple syrup. Served as a dessert, lokma is a popular coffee accompaniment. You can add chocolate sauce, honey, cinnamon, sesame or grated walnuts to these bite-size pastries. 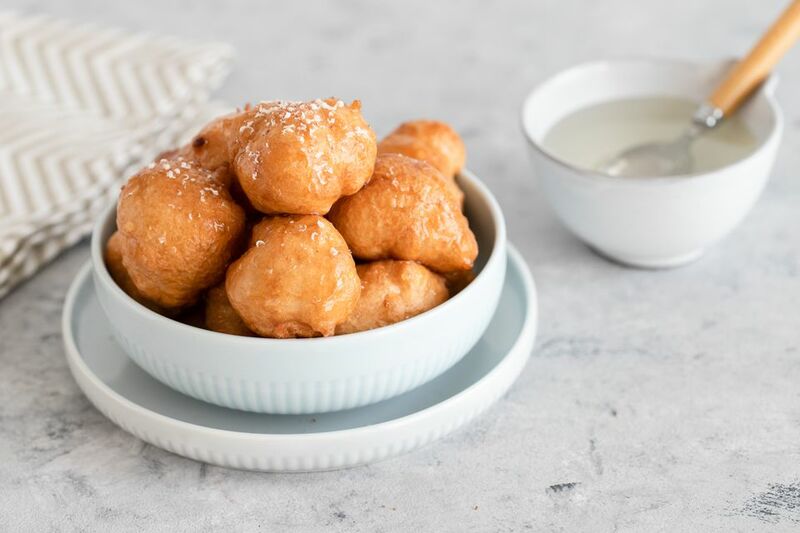 They are not to be confused with Awamat, which are crisp doughnut balls that are fried to a golden browned crisp and then coated with simple syrup. Awarnat are sweet treats from Lebanon. Lokma is often baked in batches and served to attendees of special occasions, such as weddings, business events, house parties, and even funerals. The tasty treat is especially popular in Western Turkey. Many native Turks take large pots of Lokma to special occasions; some bring the ingredients with them and bake a batch on the premises. Note: While there are multiple steps to this recipe, this lokma dough is broken down into workable categories to help you better plan for preparation. In a measuring cup, add yeast and sugar to warm water. Stir until dissolved. Allow to sit for 5 to 10 minutes. Add yeast water and stir with an oiled wooden spoon until a dough-like consistency form. Cover and place in a warm area and allow to rise for 1 1/2 hours, or until doubled. Preheat vegetable oil to 375 F.
Spoon dough by the tablespoon into vegetable oil and allow to cook for about 2 minutes on each side, until each side is a golden brown color. Repeat with remaining dough. About 20 minutes prior to frying the dough, mix all ingredients in a saucepan over medium heat until sugar is dissolved. Bring to a boil, then allow to simmer on low for about 10 to 15 minutes, until it becomes a syrup consistency. Do not stir frequently because the sugar will make the syrup cloudy. Lokma is especially popular in the summer. In fact, many people will take this easily transported snack to the beach. The Turkish word lokma means "mouthful" or "morsel," which describes these tiny bites of heaven. Lokma originated with the sultan's cooks at Ottoman Empire palaces. For many centuries, the recipe for Lokma was kept secret but became a traditional Turkish dessert in the 20th century.